Nora Dunn’s “Working on the Road” – Love. Life. Practice. Let’s start by doing a full-disclosure: if you decide to use this review to purchase Working on the Road, I will get a cut. In fact, I’ll get a bigger cut than the folks at Unconventional Guides (because Chris is cool like that). I also was given a preview copy of the Guide for review purposes. It’s not real, but I WANT this travel case! I didn’t expect to learn much when I opened up Nora Dunn’s new book. It’s subtitled “the Unconventional Guide to Full-time Freedom,” and that’s something that I pretty much already have. Nobody but me forces me to do anything, and as long as I’ve got my laptop and an internet connection (and sometimes not even that) I can earn a living. Heck, I write my own articles on how to travel and work efficiently! Plus, as books go, it’s relatively short…so how much could she really offer me? Two hours later I had pages of notes and multiple tabs open on my browser. I had subscribed to her newsletter and only escaped her website through sheer force of productive will. I had also arranged for an interview with her (which you can hear part of on the Love Life Practice Weekend Roundup Podcast, and the whole thing if you become a patron). Yeah, she’s that good. Every page – literally every page – had something of value for me, and I’m not even really her target audience. I travel a lot, but I definitely have a home base – but that’s just it: it’s not a recipe for a specific lifestyle, it’s the ingredients for lifestyle design. Like any set of ingredients, you can mix, match, and select according to your taste. I was won over early on by the way Ms. Dunn introduced her journey. She talks about her current life, about the awesomeness that she experiences now – but she’s not preaching the one true way. She wrote this book because, in her case, “…it took time. I could have done it more efficiently.” She also readily admits that it’s not a one-size-fits-all situation, and so throughout the book she interviews and uses examples from a huge variety of other professional hobos. This means that there are parents with small children, parents with teenagers, solo travelers well past their sixth decade, young couples. There are people from a wide variety of classes, as well – such as Ms. Dunn herself, who sold a successful financial consulting business before beginning her travels, as well as people who just took a plunge and went on the road. It’s not all roses, either – one of the more refreshing aspects of the guide is the realistic attitude. One cautionary tale, for example, was a young woman who announced her intention to quit her job and support herself by travel blogging…but had no following to speak of, much less a stream of income. 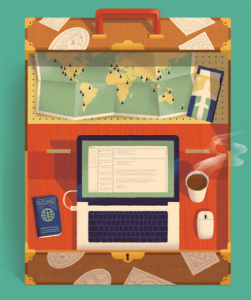 Instead of just saying “become a writer!” (though she does say it’s one of the easier ways to support this lifestyle) Ms. Dunn instead suggests that you look at your own “mosaic” of skills and how they can translate into ways of supporting your travel lifestyle. I loved the metaphor of the mosaic (so different from the singular “find your calling“) and found her descriptions of her own skillset both fascinating and inspiring. She also didn’t romanticize the actual work cost of being on the road. Yes, it’s pretty cool to pull out your laptop at the beach…but you’re still on your laptop. There is a social and personal cost to that kind of lifestyle. Her open and frank description of the difficulties of traveling with a partner – along with some suggestions for getting past them, of course – rang very familiar to me. That’s the big-picture stuff, though. I’m a fan of actionable items, of solid techniques that I can use immediately to make life better. As it happens, I got one of those before my last trip to San Francisco, taking her advice about “slow travel.” It made the trip both more enjoyable and less expensive, and it makes me look forward to an upcoming train trip with a new perspective. It’s these kinds of suggestions that really make me recommend this book to anyone who wants to travel at all, not just those who travel full time. There are suggestions for how to manage money on the road, how to find both work and accommodations, what kinds of visas are necessary…the list goes on and on in my notebook. Of particular interest was the attention to traveling with kids – talking about schooling, medical care, visas, etc. Unlike a lot of lifestyle design books, this one is definitely family-friendly. As I read, the list of things I need to get for the next time I travel kept growing – such as an International Driver’s Permit, and checking into her recommendations for Travel Insurance, and my favorite: creating my Top-Secret Encrypted USB Key. It’s positively Jason-Bournesque, and has demonstrably saved Ms. Dunn’s proverbial bacon more than once. I will increase the aura of secrecy by not going into more detail here, but you can hear a bit more about it on the podcast. Better yet, you can read about it in the guide. Go on over to Unconventional Guides and check out Working on the Road. It’s a fast read but a slow journey. I’m confident you will find both new perspectives and solid tools that make your life’s journey better.